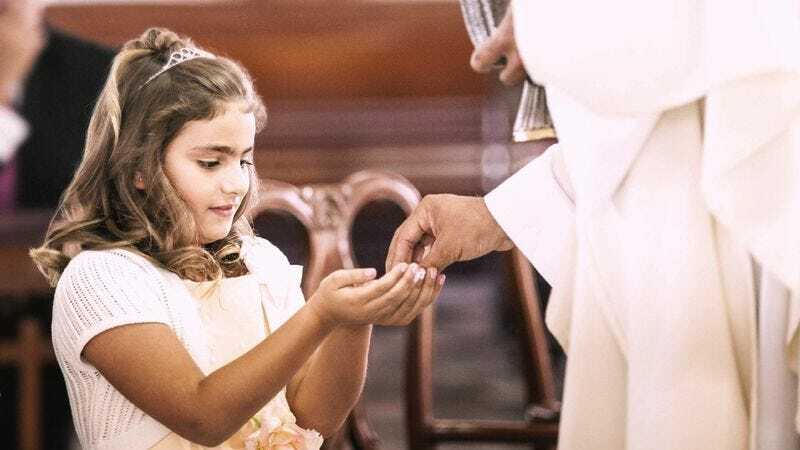 WASHINGTON—According to a Pew Research Center study of American families published this week, more children in the United States are being raised with the religion of their pushier parent. “Interfaith couples have become increasingly common nationwide in recent decades, and as a result, we’re seeing more and more kids growing up practicing the faith of the parent who’s more aggressive and overbearing,” said researcher James Gammon, citing the rising number of dual-faith households in which children celebrate the holidays, traditions, and rites of passage of the parent who consistently drowns the other one out. “The traditional narrative is that couples with common beliefs would get married and raise kids in their shared religion. But nowadays, many Americans are pairing with someone of a different spiritual background, undermining their partner’s religious beliefs by saying, ‘You stopped going to church’ or, ‘The kids will feel alienated in your faith,’ and making the whole family attend their preferred place of worship.” In addition, Gammon noted that a growing number of families aren’t raising children in any faith at all due to the uncompromising refusal of one parent who thinks all religion is pointless.